I don’t know what you think of this picture. But I’ve tasted that meal. And despite how unphotogenic it may be, it scores a perfect 10 on taste. Braised chicken, BACON, rich wine sauce, and pearl onions. How could it be anything but good? Despite the fact that this recipe is the brainchild of Cook’s Illustrated, this is not a sign that I have called a truce with his Bowtiedness. I remain resolute in my stance that I will never again contribute to CK’s golden parachute through yearly subscription fees to the magazine. I haven’t yet named a replacement for CI. But I’m holding follow up interviews with Fine Cooking, Bon Appetit, and Saveur. It would really sway my opinion if one of those titles had something magically delicious like this in an upcoming issue. BAH Note: CI calls for boneless, skinless thighs to be cut in half. I used a combination of boneless and bone in thighs. If you use bone in thighs, you wont’ be able to cut them in half but you will still want to remove the skin and as much fat as possible. If using boneless thighs, your cooking time will be less than mine. Combine wine, chicken broth, bay leaf, and thyme in a saucepan. Bring to a boil over medium high heat and reduce by half. Once reduced, remove from heat and discard the thyme and bay leaf. While the liquid is reducing, cook the bacon in a dutch oven over medium heat until well browned and the fat has rendered. Transfer the bacon to a paper towel lined plate and drain off the bacon fat. Return 1 tablespoon of the bacon fat to dutch oven and heat over medium high flame. When just smoking, add half of the chicken and cook for 2 minutes on each side until lightly browned. Transfer the chicken to a plate and brown the remaining chicken in another 1 tablespoon of the bacon fat. Transfer the rest of the chicken to a plate. Melt the butter in the empty pot over medium high heat. Add the pearl onions and mushrooms and cook for approximately 10 to 15 minutes until the mushrooms release their liquid and the onions and mushrooms begin to brown. Add the tomato paste to the pot and cook for 30 seconds before adding the flour. Cook for another minute and then add the reduced wine mixture and deglaze the pot. Return the chicken and any accumulated juices to the pot along with half of the bacon. Bring to a boil, cover the pot, reduce the heat and simmer for 45 minutes until the chicken is cooked through, stirring occasionally. Serve the chicken and sauce garnished with the rest of the bacon. Mmm, I think the picture is just fine – it looks rich & so savory! You know my vote is for Fine Cooking, but it only comes out every other month. Bon Appetit has great food articles but I don’t find myself making that many of the recipes. Rich and savory it is.� I’ve been flirting a lot with Fine Cooking lately but can’t get myself to commit. Oh sister, I BELIEVE you. However brown it looks in the picture (which I actually think is a great-looking picture) I know it’s gotta be divine. I’m putting this on the menu for next week, baby! Jenna, I hope you will make friends with Quick Coq au Vin. i know now what you speak of, this picture is fantastic. i have attempted coq au vin once and tho it tasted fine, it looked so horrendous i dumped the entire thing. it’s the red wine that taints the tender chicken flesh — a curse & blessing, i suppose. Lan, there is something a little disturbing about purple stained chicken. Unless of course, it’s being served at a Baltimore Ravens themed dinner. I must get a dutch oven. I viewed the picture larger. I may or may not have licked the screen. It’s that little bit of the gravy/sauce dribbling over the mashed potatoes that has me swooning. Oh. My. Gosh. Want. Erin, I regret not buying a quality dutch oven sooner in my cooking adventures. IF you can swing the cost, I highly recommend a Le Creuset 5 1/2 quart…I use it for EVERYTHING. I admit, mine was a gift but after having it I can absolutely say that with proper care, that piece will be with you forever and you will totally get your money out of it. I love mine so much that it inspired me to actually save cash to buy some additional Le Creuset pieces. can’t the bacon just be bacon not a lardon? and thighs…mmmmmmmmmmmmmmonions and wine mmmmmmmmmm Can i drink some also? mmmmmmmmmmmmmy god………. Papa, you could certainly fry up some bacon and then crumble it into the dish.� But since my bacon came straight from the freezer, cutting it into lardons was a necessity. I think this photo looks delicious! You had me at bacon. Bacon is a big selling point for me too.� I hear you had an apple picking adventure with Lan.� I’m sad that I couldn’t join you. Any braised dish is a challenge to photograph, don’t you think? But oh, the eating is good! 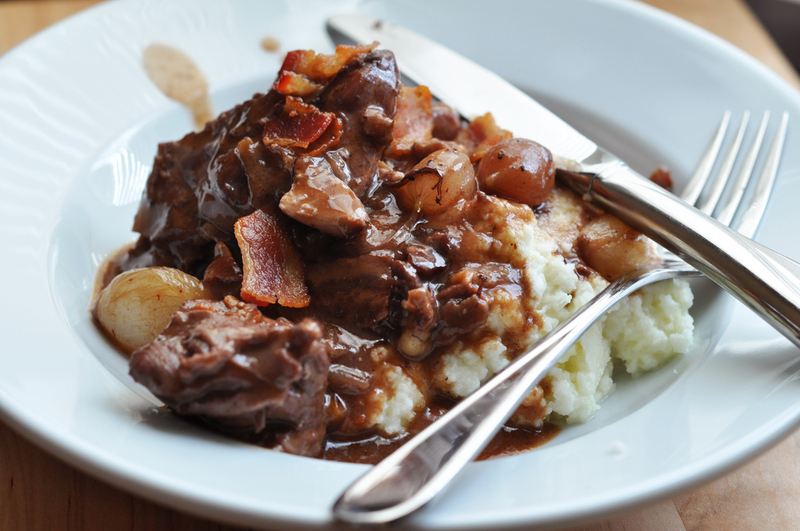 Kitch, braises are the ugly ducklings of my kitchen.� Horrendous in pictures but glorious going into my belly. Many of the best foods aren’t photogenic. Believe me, I know! But, I do have to say that the light in that photo is beautiful. I think you did a pretty good job photographing a not-so-photogenc food! 🙂 Ok, now on to the coq au vin… I want that for dinner. Jen, it’s like when Miss Tyra talks about “ugly pretty” on ANTM.� I think many foods have an ugly pretty about them.� And they usually taste spectacular.� I agree 100% on the photos in Saveur.� I don’t think I’ve made many recipes from Saveur but I gladly hand over the cash to be able to drool over the pictures. Thanks for another Fantastic dish.